Mexican Cactus 10ml. 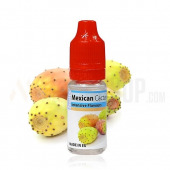 Sweet & Sour Cactus fruit with a hit of Aloe-vera in the background. Brilliant together with Banana. Very refreshing and relaxing. Dosage: 7-10%. Bottle 10ml made from PET material, childproof cap, long, thin dropper. Produced in EU.